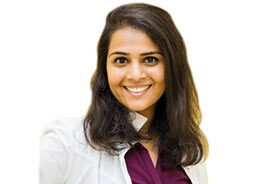 As a physical therapist, Amrita Mahimkar, MSPT, collaborates with many of the other specialists at the Century Medical and Dental Center in Brooklyn. Like every patient who comes to her, you have some kind of functional limitation. She treats you with compassion, listening to your complaints while planning an effective treatment. As a physical therapist, Ms. Mahimkar can refer you to other specialists if your condition warrants further treatment. But she understands that her therapeutic techniques play a role in your speedy recovery. So she incorporates these techniques during your treatment whenever appropriate. Ms. Mahimkar completed her Master’s degree in Physical Therapy from the University of Indianapolis. She has more than 8 years of experience in physical therapy. She’s currently a valued member of the team of specialists at the Century Medical and Dental Center. Fluent in English and Hindi, she works with anyone who needs physical therapy to gain strength or regain functionality. She provides goal-oriented treatment plans to get you back to your normal life as quickly as possible. Start your rehabilitation today with Ms. Mahimkar.